The University did a great job at updating the Track Complex with the new surface and throwing areas, but they are not fully utilizing the space to its full potential. The track complex for one is missing press box for events. A permanent press box should be built cantilevered on the top of the bleachers. Also UH needs to build a better and more official entrance to the complex. They can even incorporate the Carl Lewis statue that use to be in the hall of fame. Finally, they should tear down the run-down student tennis courts and build a concession and restroom facility in its place. 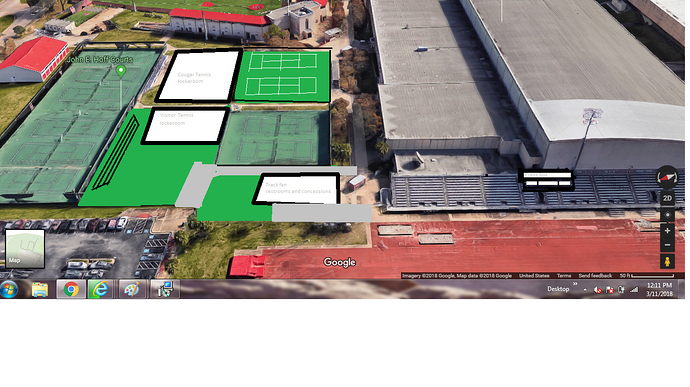 On the opposite end of it and in the grassy knoll UH can build 3 to 4 indoor tennis courts for the tennis program. By building the concessions and restrooms in the partial footprint of the rec tennis courts the spectator facilities can be used for both Tennis and Track events. Finally, the bleacher seating can be extended the length of the competition tennis court for no more obstructed views. UH if really missing out by not taking advantage of the track complex and possibly the tennis courts as a source of revenue. By adding fan amenities UH can hold more track events and possibly more NCAA events. By renting out the complex to track and tennis competition organizers it would be a source of revenue for the athletic department. I actually took a google maps satellite screenshot and doctored up my ideas then sent it to the head of facilities and Pezman, but I know my idea won’t be taken seriously with my lack of connections or ability to donate mass sources of funds to UH Athletics. Great idea. Keep pushing it. If you don’t get any response, go up the chain to Ms. Khator. We have some good T&F and Tennis boosters. Need to see if we can find a way to get them involved.